We knew this already, but our three weeks in Mexico drove the message home on an almost daily basis. This is the story of three South African amigos fumbling their way up a few volcanoes and some jagged rock faces in the land of chilis, tortillas, piñatas and mustaches. The plan was simple enough: keep the plan simple, and figure the details out when we get there… How difficult could two volcanoes and some rocks be? Three objectives, and three weeks to accomplish them. The plan (if you can call it that) was for Rick and Michael to head straight to the primary objective and highest peak in Mexico, Pico de Orizaba. They would start figuring things out while waiting to hear whether Chris (whose passport was precariously full) would be able to enter Mexico at all. Looking back on it, it’s classic hubris. With Andean experience above 6000 metres, Chris felt confident the altitude would be no obstacle. Having been in the high 5000s in the Cordillera Blanca, Michael thought he knew what he was in for. Only Rick, having suffered up Elbrus, was properly prepared to suffer again. We semi-confidently set Christmas day for our summit attempt, just four days from sea level. And one by one we succumbed. A strenuous hike at 3000 metres laid Rick low. Our first acclimatization hike to 4800 metres got Chris. And the next day Michael was brought down at the same height. It was a sobering blow for the Supertramps. Other people were passing through base camp and reaching the summit – most of them looking haggard and miserable on the way down. We decided that wasn’t the summit story we wanted. We wanted to get to the summit on our terms: quickly, confidently, and with the energy to enjoy it and be safe. The prospect of no Mexican summits seemed all too possible, and all too much to handle. There we were, getting ready for a short sleep and an early start up an easy mountain. And once again our overconfidence and poor planning had stymied us. Morale hit an all-time low, and we regrouped in the dust-covered tent to gather our thoughts. The prospect of no Mexican summits seemed all too possible, and all too much to handle. Eventually we were able to dry our eyes and we made a plan. Michael would hitchhike to Amecameca to rent some crampons, Chris would hitch to Santiago to fetch the other gear, and Rick would look after the dusty-getting-dustier tent. Finally, we could have our pre-summit dinner and go to bed. We got up a few hours before sunrise, ready to hike the 1300 vertical metres and seven horizontal kilometres to the summit. And immediately got lost in the dark. Our delicate morale could hardly bear it, but after stumbling around precarious cliffs for two hours, we retraced our steps and found the very well-trodden path with the first rays of dawn. Two hours behind schedule, the day was a race against the bad afternoon weather. And to climb Iztaccíhuatl (the white woman in Nahuatl), you have to climb her feet and knees, cross her thighs and stomach and finally finish on one of her two… summits. Each time we summited something, we saw how far there still was to go, and we debated whether we still had the time to make it safely there and back. Rick did his best to keep spirits high, and after about eight hours we made it to the very easy glacier crossing before the final summit scramble. Elation! We had managed to summit something! After being sure we wouldn’t make it, the relief at not having to wake up the next morning to try again was palpable. We’d spent a good few hours above 5000 metres and it was time to scramble quickly back to camp. The Supertramp morale was revolutionised! 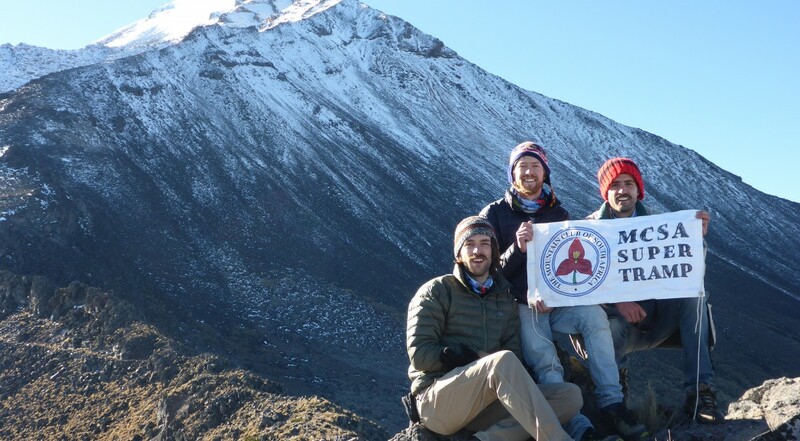 We felt that we could return to Orizaba and give it our best shot, safe in the knowledge that we had at least one summit shot with the MCSA banner, should we not make it up. After a rest day of fruit salad and unwittingly exploring the world’s largest pyramid (The Pyramid of Cholula), we returned to the base camp at Pico de Orizaba, ready for a New Year’s Eve summit the next day. Base camp was cold, windy and foggy, and chances of an easy climb seemed low, but as we turned in for our 7 PM bedtime, the skies cleared and the summit glacier beckoned promisingly to us. Suddenly we knew we would do it. When the skies cleared and the summit glacier bekoned to us, we knew we would do it! An early morning, a quick breakfast of our secret oatmeal concoction and we were on the trail by 1:30 AM. We set a brisk pace and took turns telling each other to slow down. But we felt good and our legs were enthusiastic to go. We passed a few other groups, and quickly passed our previous high point. We entered the so-called ‘labyrinth’ of ice and rock before the glacier proper, but the well-worn snowpack was easy to follow in the dark. We had a quick break to drink and get out our axes, and started the long crunch up the endless slope to the top. The snow was perfect and firm, Chris set a good pace in the front (breathing and wiggling his toes fiercely to keep them from frosting over) and the angle was just low enough to make the going bearable. After an indeterminable time on the featureless slope, we zagged past a rocky outcrop, which we knew to mean the summit was approaching. Feeling strong from our acclimatisation, we kicked into high gear and marched upwards. The slope steepened, then slackened, and we were there! We hit the snow-free crater-ridge (and what a crater!) just in time to welcome the first rays of daylight (and most welcome they were for our freezing toes). 5636 metres above sea level, the third highest point in North America, and the biggest volcano any of us had been on. After photos and a celebratory naartjie, we started loping back down the slope. Rick and Chris enjoyed sliding down the slowly softening snow, even practicing some self-arrest, but the altitude had finally started to catch up with Michael. We hit the crater-ridge just in time to welcome the first rays of daylight- on 5636 m above sea level! In no time, we were off the glacier, through the labyrinth, and walking barefoot back into base camp. Feeling strong, we were very pleased with our eight hour tent-to-tent time. Climbing a mountain is an amazing feeling, but the comfort and relief of being out of danger and warming up a cup of hierbabuena tea (rooibos is a rare commodity in Mexico) is equally good. Before long we were in the back of a Ford 4×4 heading back into town, knowing that the hard part of our journey was behind us. What beckoned was travelling, bolted climbing routes, and enough tacos to make you sick (Chris, to be precise). The Supertramp story doesn’t end there: there were epic multipitch climbing routes in El Potrero Chico, some of Mexico’s finest tequila, many more buses, more pyramids, and amazing times shared between three good friends. But we had done what we came to do. Eventually the trio disbanded and continued in different ways. Super Rick went first, and after a three hour detention on the Mexico-Texas border (no wall yet, he reports) he made it to California’s Lake Tahoe, where he spent six glorious weeks skiing up and down the West Coast’s finest powder. Super Chris left shortly thereafter, and after two days in Mexico City sorting out his passport and visa woes. And Super Mike… some say he is still to be found in a small pueblo in Mexico, climbing harder and harder routes, living off beans and the occasional tortilla, and slowly forgetting how to speak English. We’d like to give a very sincere thank you to the Mountain Club of South Africa for honouring us with the Supertramp Award of 2016, that made this amazing trip possible. Also to our family and friends for putting up with our nonsense and supporting our adventure.